Thank you so much for the comments on my little skirts! I really enjoyed making them. They were easy and fun to make. I hope you'll try making some too. Please leave a link if you do! Now I have very exciting news to share. I had the great fortune to win a very special giveaway a few weeks ago. Janine, of the lovely blog Simple Things, held a Carry It Forward giveaway and I was the winner chosen at random! This is a unique giveaway because it requires the winner to make something special to give away to someone else. The winner, in turn, makes something for the next recipient, hence the name Carry It Forward. I had been watching this giveaway since before I had my own blog, as it was carried forward by two other delightful blogs I enjoy reading: Jelly Jam and HenHouse, so I was honored and thrilled to win the giveaway myself and have the opportunity to carry it forward too! Janine's package arrived in the mail last week, and we were all very excited to open it. She had wrapped it in pretty tissue paper and tied it with string, which is how I often package gifts too. Janine lives in the UK, and her card has an adorable heart-shaped Union Jack on the front. I love the folk-art look to the card. And in a weird coincidence, the card arrived the day after I made that little felt heart ornament I shared recently. We must be on a wavelength! Janine wrote a very sweet message inside, letting us know that she and her kids took the time to look up our city on a map. We did the same thing with their hometown! It's nice to know that blogging has also given our families a lot of interesting learning experiences; my small Bears were overjoyed, hyper even, to receive a package from another country. We opened the package and found wonderful things inside. Janine's giveaway had an owl theme, the giveaways that I observed before Janine's had Christmas and Valentine's Day themes, respectively. I was so excited to find such pretty handmade things and other lovely trinkets in Janine's package. Janine sent me a gorgeous crocheted owl ornament and crocheted rose brooch, both of which contain my favorite color, purple. She didn't know this, of course, but it was very fortuitous. She also included two tea light candles, an adorable wooden owl ornament with the word "special" on the owl's tummy (it is special! ), some pretty rosy clothespins and an assortment of beautiful wooden buttons, some with roses and others with hearts and daisies, in two sizes. Everything is pretty and just my style. Thank you so much, Janine and family. We all love this package of goodies and we are glad we (I) participated in your giveaway and we (I) have had the opportunity to connect with you in Blogland. I hope my readers will stop by and say hello to Janine and check out her lovely blog. She is a wonderful lady. My giveaway has an autumn theme. Autumn is just around the corner and I don't know about you, but I like to be ready. Here's what you'll receive if you win my giveaway: two autumn-scented votive candles, two different kinds of buttons (apples and small green flowers), a set of "jewel" stickers (perfect for scrapbooking) and a hand-appliqued tea towel. Yes, I've branched out to housewares with my applique-mania. It was the next logical step! Here's a closer look at the applique work on the tea towel. I've been practicing my embroidery skills and I think I'm starting to improve. It's my own design, just trying to be creative. The pumpkin, stem and leaves are cotton calico fabric, affixed with Heat N Bond. 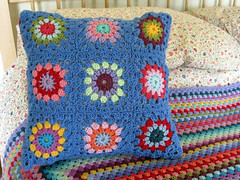 The hand-stitching is done with all-cotton embroidery floss. The tea towel itself is simple white cotton and probably should be handwashed, to protect the appliques and stitching. I really enjoyed doing the tea towel and I hope it will be a nice addition to someone's fall decor. To win this giveaway, you must be willing to carry it forward, meaning that you, in turn, offer a giveaway on your own blog which includes something you make for the winner. It doesn't have to all be handmade, though that's certainly an option if you would like to do it that way. I know that giveaways with "strings" attached tend to be less popular, but I believe that I have one of the kindest, friendliest readerships in all of Blogland and I know that many of you would love to participate in a giveaway like this. So pleeeeease play along! You won't be sorry. 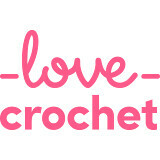 You'll have the pleasure of receiving something handmade by me (I put lots of love into it! ), and the added pleasure of making an item for the next person. I won't require you to follow my blog to join the giveaway, but would be pleased if you did, so that we can get to know each other better. I do ask that you be serious about following through with the CIF aspect of the giveaway if you enter; it would be a shame to have this happy chain of giving be broken by someone who didn't carry it forward. You need to have your own blog as well, so that you can offer your package to the next lucky winner. There's no time limit, you create your package as you're able. If you would like to be included in my giveaway, please leave a comment on this post. The entry period will be open for one week; I will close it on September 6, drawing a name at random and announcing the winner soon after that. The giveaway is open internationally. Good luck! Thanks for participating. A few weeks ago, I made this pile of skirts for the GB. I'm always looking for simple sewing ideas for little girls' clothes and I found a wonderful tutorial on a blog called Punkin Patterns; they're called Easy-Peasy Skirts and they are exactly that. We love the way they turned out, but we are waiting until it gets a bit cooler before she wears them. This tutorial made the process very simple and quick; I have slightly better than moderate sewing skills and each skirt took about half an hour for me to make, following the tutorial exactly as written. As with other tutorials I blog about, I won't rewrite Punkin Patterns' excellent how-to, but I'll show you some of the process, which I photographed as I went. I used 21-wale (also called "pinwale" or "pincord") corduroy for all four skirts. Corduroy is categorized by the number of wales, or cords, per inch. 21-wale is the finest type. It's not an especially heavy material, but I wanted the skirts to be a little bit warm for fall and winter; the GB wears tights or leggings under her dresses and skirts in cold weather, but as a worrywart, I like to make sure she is plenty warm, especially when she's on the playground at preschool. She's good about zipping her coat and remembering her hat and mittens but I always fear her little legs getting cold. These skirts will provide an extra bit of insulation. The skirts can, of course, be made with basic cotton material too, and I might do a few like that for next spring and summer. All but the aqua corduroy is by Robert Kaufman, I think from the Cool Cords line. The aqua is by Valori Wells, from her Nest line. I bought them all from Fabric.com; they have an excellent selection of lightweight corduroy. Each skirt required half a yard of fabric. The width of the skirt should be twice the waist measurement, to allow the fabric to gather once the elastic has been put in. With corduroy, the lines (wales) run up and down perpendicular to the width; on the bolt, they'll look like they're going sideways. I'm a big believer in having lots of thread - even if you don't use a color very often, it's nice to have it. Thread is cheap and easy to store. For these skirts, I only purchased one color - that neon green you see near the center of the photo. It was a shot in the dark, because I didn't have the fabric with me when I bought it, but it ended up being almost perfect, well worth the $1.50 it cost. You'll want to make sure you have the right elastic too; I used 1" no-roll elastic to keep the waistbands nice and flat when she wears them. I often buy my elastic from Fabric.com too; they sell it by the 1/2 yard, just like their fabrics, and the prices are great. Easy-peasy, indeed. Sew the ends together, hem the bottom, make a tunnel for the waistband elastic. It was quick, quick, quick, back and forth between ironing board and sewing machine a few times. There were minor episodes of measuring and pinning, but nothing too strenuous. I deliberately left the fabric a bit long; Punkin Patterns suggested having the skirts fall just below the knee and I added another inch or so beyond that. This is mostly for longevity of use; the waists are very stretchy and she's a very skinny little thing, small for her age. I figure that with the extra bit of length, she will be able to wear her skirts for at least a couple of years. We're not fanatical about modesty in this house; I'm just happy to let her be comfy for a long time to come. A longer skirt means easier playing. This one is my favorite. I love sweet little birdies on girls' clothes and the colors are so pretty. This one is the GB's favorite. She likes the "hot pink and hot green" flowers, she says. The owls are really cute and we're big owl fans around here in general, so why not wear them too? This brown paisley pattern is so pretty. It's nice that brown is a girls' color again. I really enjoy making clothing for my daughter. I wish it were more economical to sew clothing, like it used to be. I'm dedicated to bargain-hunting and rarely splurge on anything expensive for the kids (well, or anyone else, really), so I tend to buy most of their clothing second-hand. Sewing clothing at home is enjoyable and satisfying, but it doesn't always save money. These skirts were very thrifty, though; I bought the corduroy when it was discounted so each half-yard cost about $3, plus the cost of the elastic (about 50 cents per skirt). A cute $3-4 skirt is pretty hard to beat, second-hand or otherwise, so I feel they were a very good value. They're going to look really cute with her winter school shoes. They're beige leather with appliqued peacocks on them. Lucky girl. I'd like to find grown-up shoes featuring peacocks. She loves her new skirts and she's excited to wear them. We can pair them with long-sleeved tees and sweaters, with tights or leggings. She's starting to pick her own outfits now and she's surprisingly adept at this. She also likes to pile on three or four necklaces at a time, which is fine except for when she has ballet class. I try not to place much importance on looks or wardrobe but it's interesting to watch her develop her sense of self: she knows what makes her feel good. In the age-old tradition, full skirts inevitably lead to spinning. Swirly, twirly, girly Bear. I just wanted to say how much I appreciate your kind words on my last post, about feeling discouraged. It just seemed like some things were changing in Blogland and I felt concerned. I think people are correct about other social media taking over. I'm not really into any of that myself, though. I started my blog because it seemed like fun, and also because I love to make things and enjoy sharing them, but was left feeling like other social media venues weren't right for it. People can be surprisingly harsh. Blogging seemed a better choice for me. Then I realized that a blog could be an excellent place to record daily life "stuff" and I've loved doing that too. I'm proud of my simple, satisfying life at home; we've worked hard to have a life that we truly enjoy. It's a blessing to have a place like this to discuss and share with like-minded people. I try not to pay attention to stats or followers but of course I am thrilled to know that people are reading my blog and coming back for more, and that I have even inspired a few people. These interactions are some of the most fulfilling parts of blogging. So thank you for being here and for being supportive and inspiring! 2012, in his final months. 2003, about two months old. 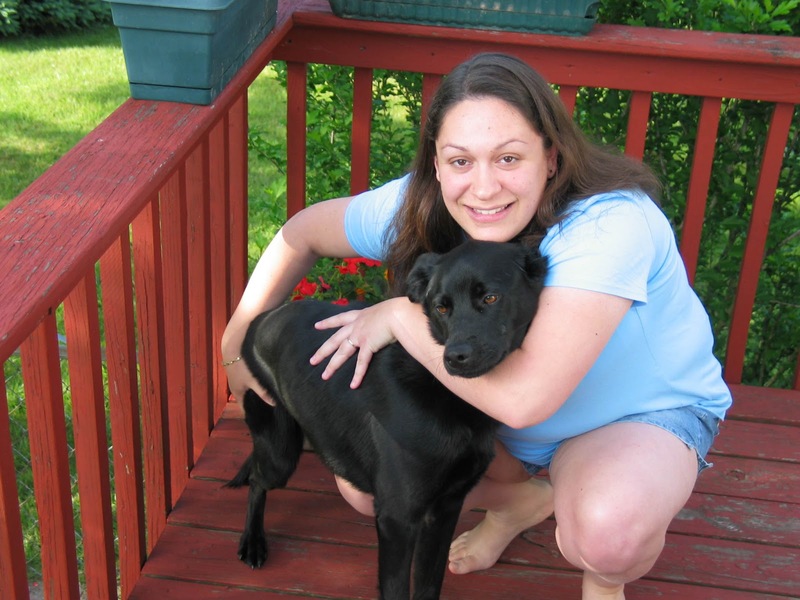 2005, two years old with me (I was pregnant with the LB). 2009, with GB (6 months) and LB (3.5 years). A year ago today, we lost our faithful friend, Angus. He was going on ten years old and had developed tumors in his lungs. He was very sick. He would no longer eat or drink and had great difficulty breathing. Surgeries and medications were offered, but we declined. We wanted him to let us know when it was time, and he did. When the time came, we all went to the veterinarian's office with him and said goodbye. 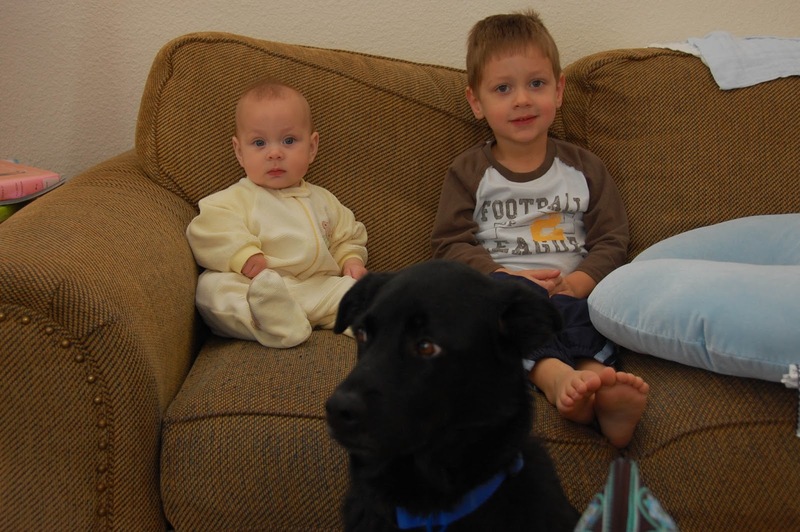 He was our first "baby." We got him a year after we were married, and we took him everywhere with us. He loved to camp, hike and play in water. He was not always well-behaved. Actually, he was a pain in the neck. 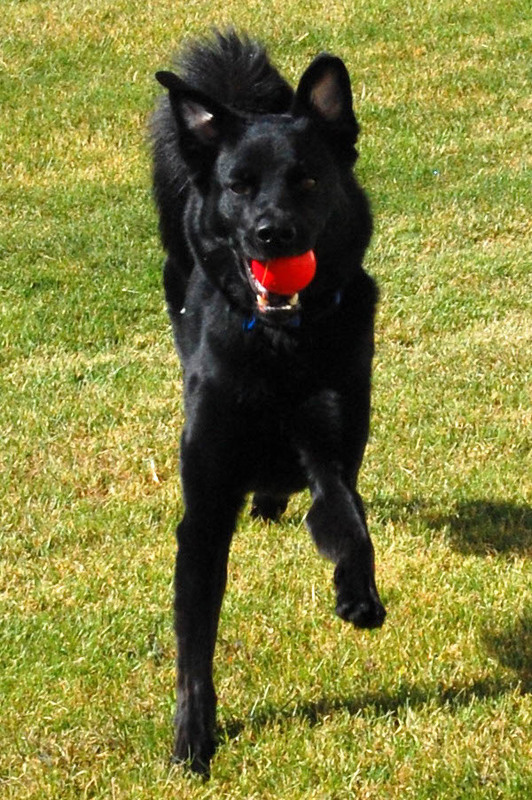 He was active and athletic and loved to run and run - the Forrest Gump of dogs. Sometimes he ran away, getting free of the house or yard, and tearing off down the street. The Bear or I would march around holding his leash, calling for him while he played hide-and-seek; he would see us, wait expectantly, then bolt away. He would do this over and over, every time we got close. Finally, he'd give up and walk to us. Reluctantly, he'd allow himself to be leashed and dragged home. He loved it here but sometimes he got other ideas about how he should be living. I named him myself. 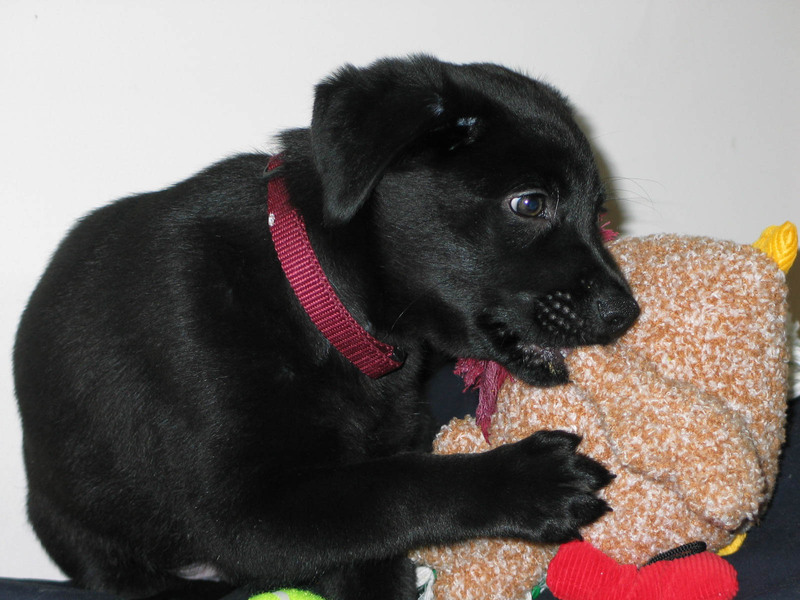 He was part of a litter of 13, born to a shepherd-collie mix mother and a black Labrador father. He was a rescue; we got him from the owners of his mother, who were planning to send all the puppies to the pound. 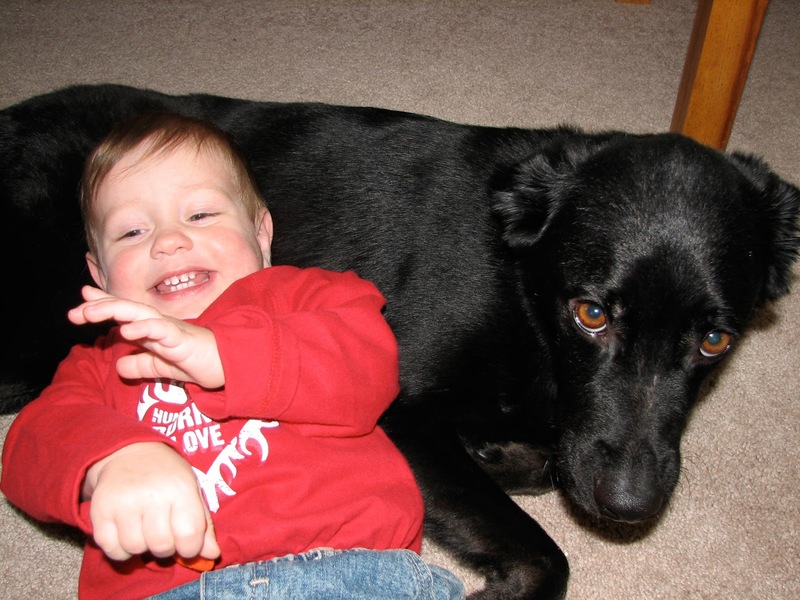 His father was enormous, about 90 pounds, and our puppy was the only all-black one in the litter. I presumed he'd be huge like his father, and given his blackness, I thought Angus was a good name for him. Big and black, like a bull. But he never got very big, and his fuzzy puppy hair remained, very unlike his father's sleek, glossy coat. As an adult, Angus weighed barely 40 pounds, and stood about 32 inches on all fours. We were actually very glad he stayed so small; we realized that his activeness would have been a lot more annoying, and probably destructive, if he'd been much bigger. Angus was very good with the children. When we brought the LB home from the hospital, he was a little concerned, partly because we'd left him an unexpectedly long time, having neighbors come to feed and walk him. Sometimes the Bear went home too. I'd needed to be there for nearly a week, which we hadn't known before we went. By the time we came home, he was really missing us. And we had a bizarre new creature in tow, which was confusing. But Angus did okay; he smelled the baby before he saw him, standing next to the bassinet which was just a little too tall for him to look into. We put the baby on the floor and he sniffed him, butted him gently with his nose and then stood over him, watching intently. Later, he behaved similarly with the newborn GB. As the kids grew, he was very patient with them, allowing them to climb and crawl on him. Angus was always gentle and sweet with them both. We miss him a lot. But I don't think we want a new dog, at least not now. There's a lot of freedom in not having a pet. Money-savings, too. 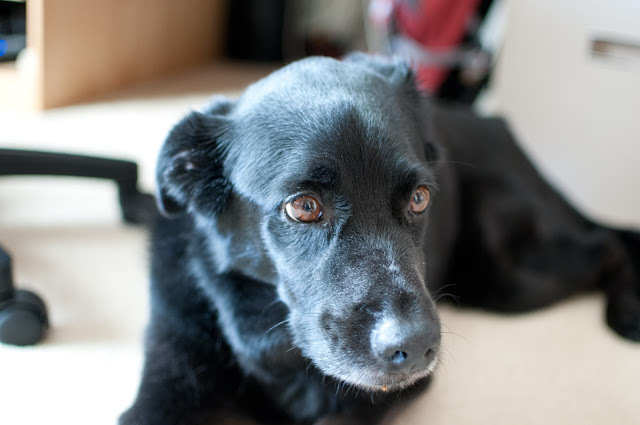 I loved having him around the house; in his later years, he enjoyed staying near me as I worked around the house. 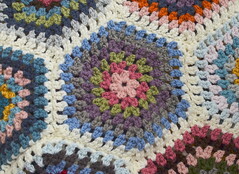 He loved my crochet hobby; as blankets grew, he'd nestle underneath them at my feet. But a dog is a big commitment and we're getting busier all the time. We're beginning to think about possibly having a small pet, probably a guinea pig, because it would provide valuable lessons in responsibility for the children. We're also considering adopting a pair of chickens and have been researching that pretty heavily. We all love animals and enjoy having them around, but we want to be able to give animals everything they need. I think fondly of my old friend. He wasn't perfect and neither were we; he could have used some formal training. But he was mostly a very good boy. We will always remember him as a part of our family.